This week saw the annual BNA Christmas Symposium which was held in Canary Wharf in London. This symposium, entitled, 'Brain technologies: Brave new world?' reviewed how neurotechnology is playing an important role in helping us understand the brain, as well as having utility in the diagnosis, treatment and management of CNS disorders. Talks were presented by a series of eminent speakers including Cambridge's own Brain Prize winner Professor Wolfram Schultz and Dr Su Metcalfe. 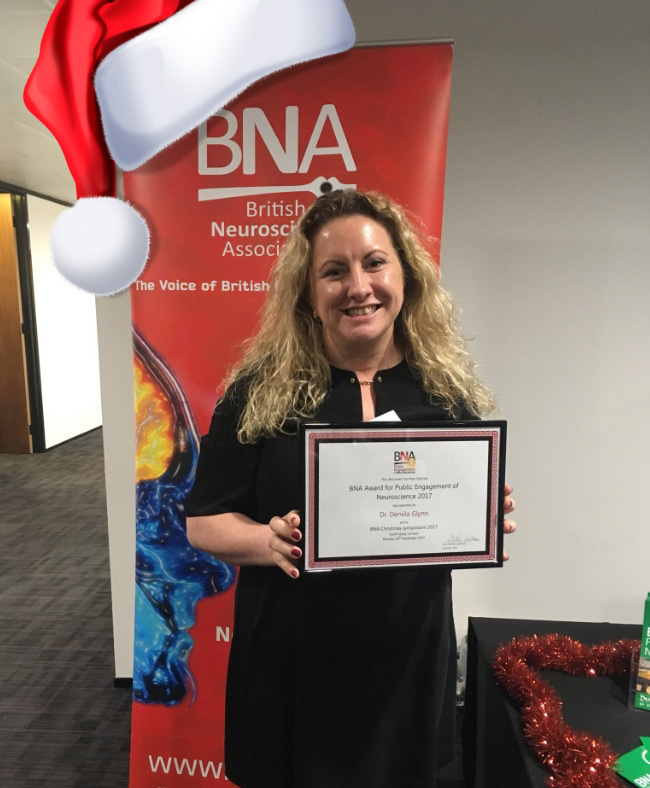 Dr Dervila Glynn, Coordinator of the Cambridge Neuroscience IRC was delighted to receive the 'BNA Award for Public Engagement of Neuroscience 2017' in recognition of her work, particularly with Cambridge BRAINFest. Dervila will also take on the role of Chair of the FENS Communications Committee at the FENS Forum in Berlin in July 2018.